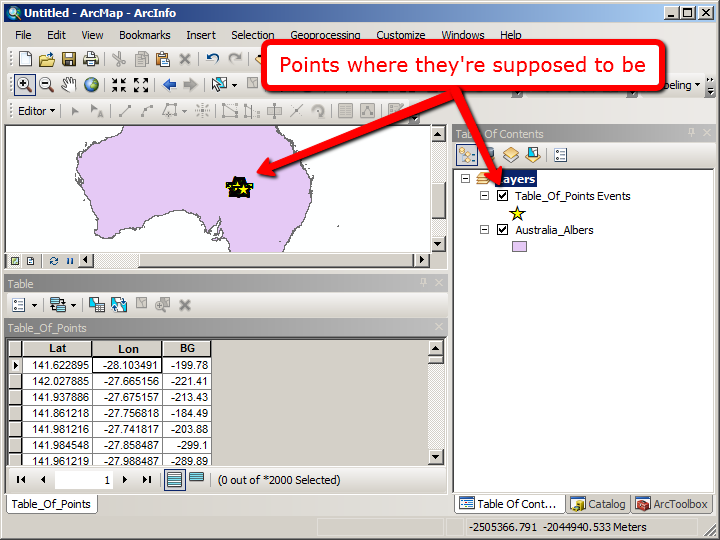 Ever tried to add points from an Excel spreadsheet or GPS log, and had them not appear where they were supposed to? Chances are you’ve got a case of muddled coordinate systems. The most common problem when adding x,y data to Arc happens when your data frame is set to a projected coordinate system using Metres as a linear unit (eg. MGA Zone 55, any UTM zone, or Web Mercator), and you are adding X,Y data which holds coordinates in Decimal Degrees (eg. 142.7878,-33.8913). By default, ArcGIS will attempt to put points at the correct position – but rather than attempting to put a point at 142.7878 degrees east, 33.8913 degrees south, it will put a point at 141.7878 metres east by 33.8913 metres south. This leads to a tiny conglomeration of points just off the west coast of Africa. If you’ve added data and end up with misplaced points – whether they’re in a tiny blob in the ocean, or in a huge span many times bigger than the earth – it’s easy to have a go at fixing it. Simply note which coordinate system your spreadsheet data is supposed to be in (hint: if it looks like “144.9598,-37.8081” then it’s probably in degrees – which likely means a coordinate system of WGS 1984 for a first guess). Then right-click on the offending layer in the table of contents, and choose “Properties”. On the “Source” tab, choose the “Set data source” button, and in the “Coordinate System of Input Coordinates” box, select “Edit”. In the window which pops up, press “Select…”, then under Geographic Coordinate Systems, choose World, and WGS 1984.prj. Press “OK” on all the windows until you get back to your map, and zoom to the offending layer – hopefully, it will be more accurately aligned! You can now export your Events layer to a permanent feature class for later use. This is only one example of how conflicting coordinate systems can give you headaches, but it is a very common one. 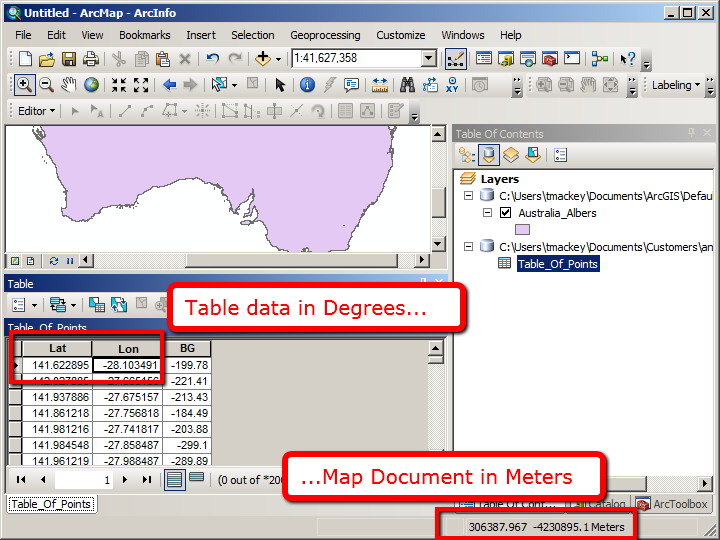 In a perfect world, all layers in your map document, as well as the data frame itself, should have the same coordinate system. While this rarely happens in day-to-day practice, it’s a good thing to strive for. Most importantly, if your x,y data isn’t displaying correctly, check that the layer’s coordinate system matches the units the coordinates are supposed to be in. 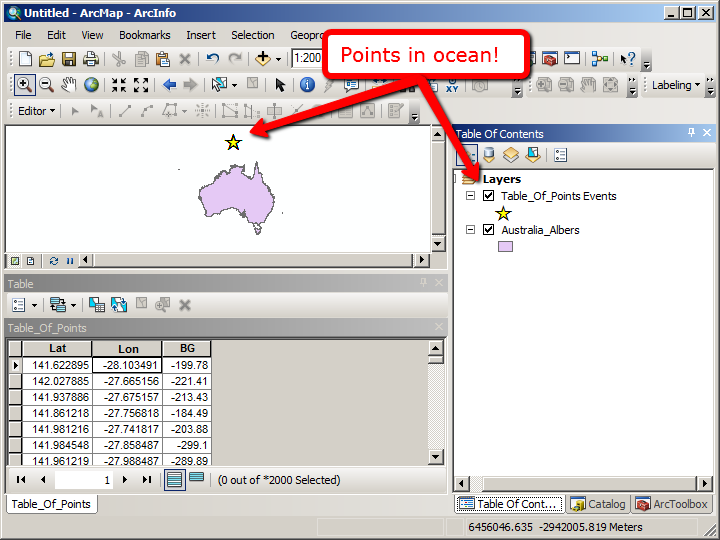 There are also two great tech articles from Esri Inc. which go into this process in more detail: HowTo: Identify the spatial reference, projection, or coordinate system of data and HowTo: Identify an unknown projected coordinate system using ArcMap. The latter has a bit of an American focus, but the methodology is sound. This entry was posted in General and tagged Coordinate Systems, Desktop, GPS on August 26, 2011 by Thom M.
I’m trying to display the x,y data with UTM from excel(xls) to the work sheet. The shp file shows the scale of 1:1,282,992 and when I put x,y data with UTM from xls file it just show on table of content and does not appear on working sheet. When I put the x,y data firstly, the scale shows 1:20,010,410,938 and when I added shp file, it didnot appear on working screen and just show in the table of content. How may i adjust for that?